Your Galaxy S6 is out there trying to make itself the ultimate contact database with as little effort on your part as possible. The interesting thing is that the salesperson in the cellular store probably didn’t explain this to you in detail. It’s a subtle-but-important capability that’s hard to communicate on the sales floor. Here’s what happens. Whenever you make or receive a call, send or receive an e-mail, or send or receive a text, your phone looks up the telephone number or e-mail address from which the message originated to check whether it has seen that address before. If it has, it has all the other information on that person ready. If it doesn’t recognize the originating telephone number or e-mail, it asks whether you want to make it a new contact or update an existing one. What could be easier? 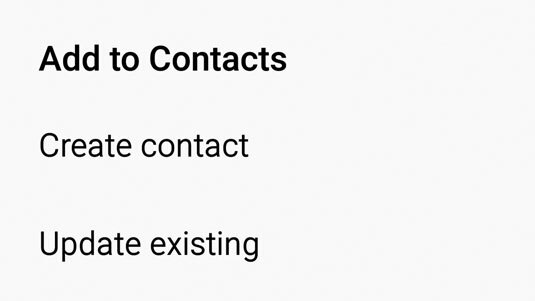 When you get a call, a text, or an e-mail from someone who isn’t in your Contacts list, you’re given the option to create a profile for that person. The same is true when you initiate contact with someone who isn’t in your Contacts list. 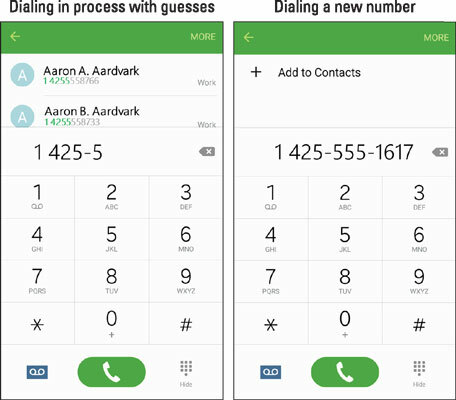 The image on the left here shows the phone trying its best to anticipate the person you are in the process of calling and, if it is not saved already, the image on the right shows how it offers you the option to add this number to your contact list. The dialing screens in process and when there is a new number. 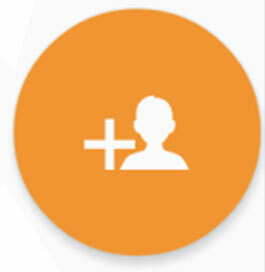 When you tap Add to Contacts, you’re immediately given the option to create a contact or update an existing contact. Your phone doesn’t know whether this is a new number for an existing contact or a totally new person. Rather than make an assumption (as lesser phones on the market would do), your phone asks you whether you need to create a new profile or add this contact information to an existing profile. Keep in mind that if you are calling an existing contact, and your phone guesses the right person, you can save yourself time and tap the phone to dial. Tap the Add a Contact hyperlink. 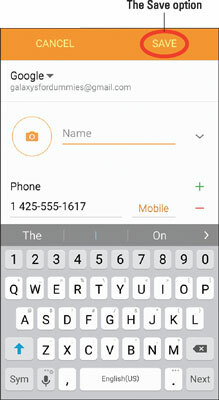 It will first check to see if you want to create a new contact or if you want to add this number to an existing contact. The pop-up as seen here gives you these options. If this is a new number for an existing contact, this pop-up saves you from having to link contacts. The Add to Contacts pop-up. Tap the Create Contact hyperlink. Tapping this hyperlink brings up a new contact page. An example is seen here. The number is already populated. You just need to fill in the correct name plus any other information that you wish to have associated with this person. When done typing in the information for this contact, tap Save at the top of the Contact. Doing so brings up the list of existing contacts. Tap the Add Contacts icon (the + [plus] sign next to a silhouette). This icon is seen here. Tapping it will bring up a blank contact page with nothing populated. Fill in the information you want to include. When you’re done entering data, tap Save at the top of the screen. The profile is now saved. Repeat the process for as many profiles as you want to create.